WOW! 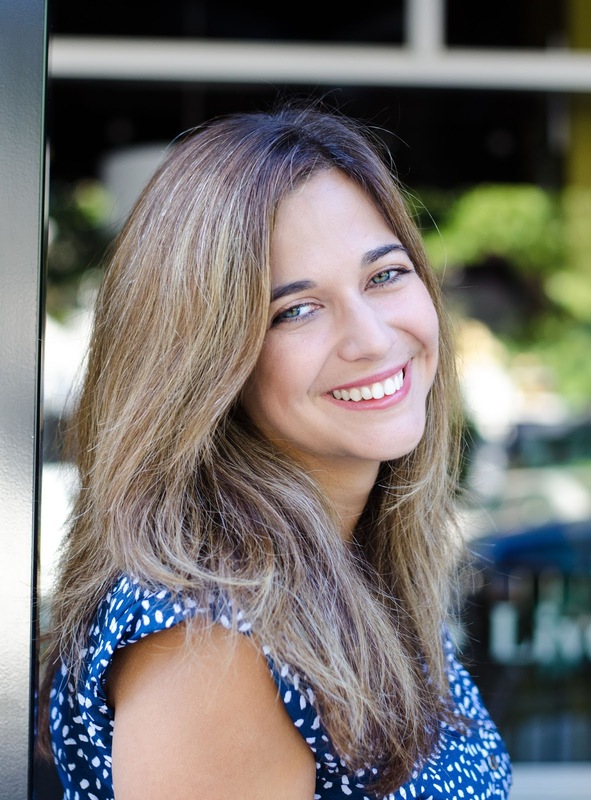 Women On Writing Blog: What Makes a Good Ghost Story? It makes you realize not all ghosts have to be evil spirits. 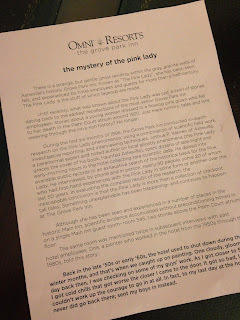 The hotel we stayed at, The Omni Grove Park Inn, has one of the more famous ghosts in the area, “The Pink Lady.” The name stems from the pink haze that surrounds most sightings of her. From what we were told, a woman fell to her death from a third floor balcony in the old section of the hotel (there have been renovations and additions in recent years) and since then, many guests and employees have reported interactions with her. Most believe she is a friendly spirit who has a special fondness for men and small children. Guests and staff have also taken photographs of the property that show magenta-colored orbs in them—what some consider evidence of The Pink Lady’s existence. After hearing such stories, my daughter insisted we go to the floor where The Pink Lady occurrences have most been reported, which happened to be one floor above ours. I was glad that she wasn’t frightened, but rather intrigued by this lore. 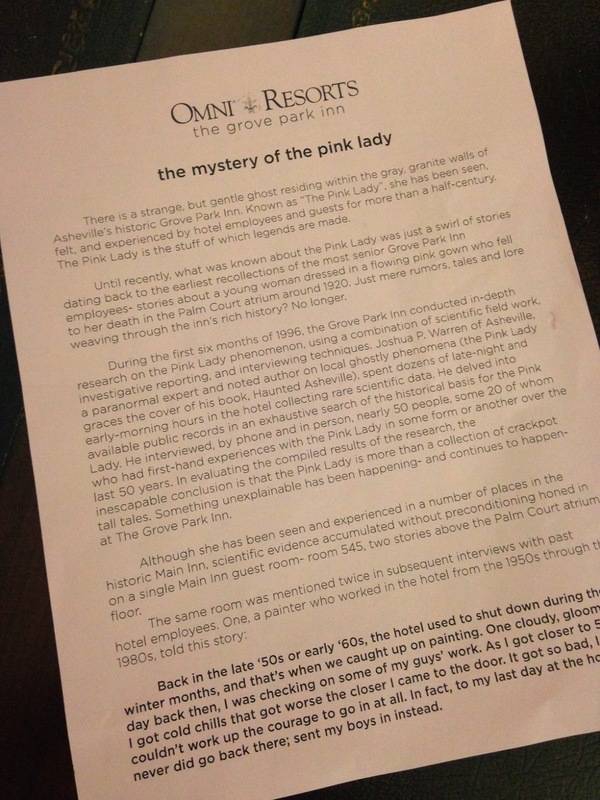 The Pink Lady story from The Omni Grove Park Inn. It shows you the dark side of human nature. On part of tour, we drove past the grounds of what was once Highland Hospital, a psychiatric facility run for many years by a Dr. Robert Carroll, until he turned it over to the Neuropsychiatric Department of Duke University in 1939. One of its more famous patients was Zelda Fitzgerald, wife of author F. Scott Fitzgerald. According to the most popular story, in 1948, a former patient was working at Highland when she decided to set fire to the main building, and nine women (including Zelda) died. There is a home that once served as an administration area on the grounds of the hospital that is the place where numerous accounts of paranormal activity have been reported, especially on the top floor. Let’s just say items do not stay in place and furniture and other items will be overturned. That house is also for sale and has been languishing on the market for some time . . . wonder why? Of course, after this tour, the wheels of my imagination were spinning, as I’ve always loved a good ghost story. I’m ready now to tackle a ghost tour in one of the other famously-haunted cities in the Southeast, Savannah, Ga.
What do you think makes a good ghost story? Who are some of your favorite authors that love to make the hair stand up on the back of your neck? Have you ever written anything with paranormal elements? I’d love to hear your thoughts in the comments! Renee Roberson is an award-winning writer and editor who also works as a Blog Tour Manager for WOW! Women on Writing. She has always been fascinated by the idea of ghosts and has included them in some of her fictional works-in progress. Visit her website at www.finishedpages.com. Joe Hill (Stephen King's son) wrote "Heart-Shaped Box" about a man who buys a ghost. It had me on the edge of my seat from the beginning to the end. Me? Write a paranormal tale? No way. However, it sounds like you might be doing so soon. I think ghost stories are way more frightening when they're based on a true story. One of my best friends lives in the Pacific Electric Lofts in downtown LA, which is said to be haunted and certainly feels like it, and is right next to the Cecil Hotel where Elisa Lam's body was discovered in the water tank on the roof. Every time I visit her I get inspired to write something just by talking to people and hearing their stories. Everybody has their own version of what they think happened. If you ever get a chance, look into it and the elevator video. I think place has a big impact on a ghost story, and being able to make that place almost a living, breathing thing. The supporting characters in the story have to be slightly off, too. Not so off that they become a caricature but subtly creepy and unsettling. I haven't read any scary books lately--I read Stephen King, Clive Barker, and Ray Bradbury years ago--but I'm a huge horror movie fan and love Japanese ghost stories. Asheville sounds like it has some wonderfully spooky places! Thanks for sharing those chilling stories, Renee, and I hope you share some more from Savannah! I've done a few ghost tours, Savannah being one of them. It was at night, on Halloween and in an old hearse. We (my husband and I)loved it. I like to read the local ghost stories from cities than I've been to. As far as paranormal writing,I live in an 1831 schoolhouse and I'm pretty sure it's co-inhabited. We've had some odd events. I'm currently writing a paranormal romance/mystery novel inspired by events while living in this house.